At least three people are reported dead after a stampede at a campaign rally by President Muhammadu Buhari and his party, APC. The rally held at the Jolly Nyame Stadium in Taraba State. The presidency has already blamed overcrowding for the deaths but did not confirm the casualty figure. 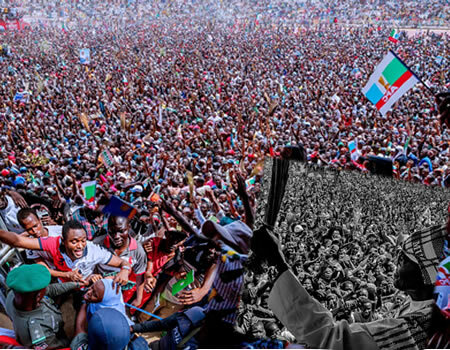 A statement by President Buhari’s spokesperson, Garba Shehu, noted that President Buhari expressed profound sadness over loss of lives at the All Progressives Congress, APC Presidential Campaign Rally in Jalingo, Taraba State on Thursday. He appreciated the massive support he is receiving all over the country, and called for restraint on the part of his supporters to avoid such tragic incidences, and improved crowd management at rally grounds. President Buhari is seeking re-election in the presidential election scheduled to hold on February 16. He has 72 opponents including a former vice president, Atiku Abubakar.